Where would you be if your son were on prime-time TV? If your son were playing college football in a huge rivalry in his first nationally-televised, prime-time football game, where would you be? I have the privilege of working with a guy who wasn’t at the game or even camped out in front of his flat-screen TV. He was at the SAY Detroit Play Center last Saturday night at 9:30, welcoming home our three football teams from their day-long trip to play games in Fort-Wayne, Indiana. 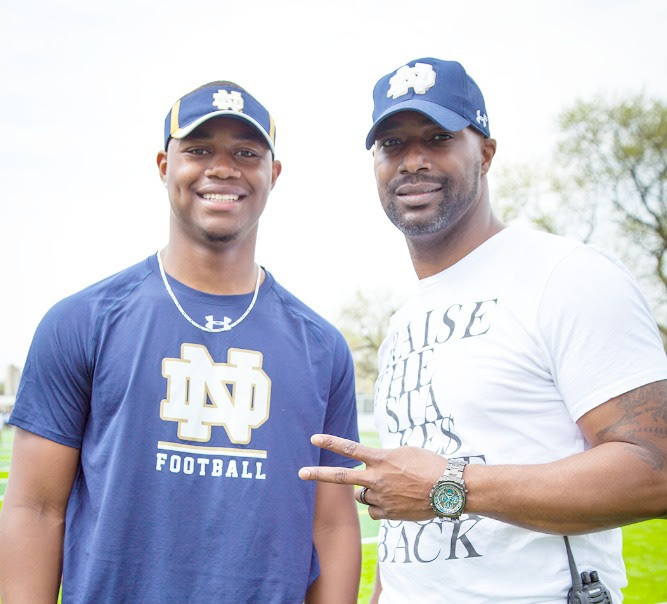 While Derrick Hayes’ son, Daelin, a freshmen at Notre Dame, was causing trouble for the Spartans last Saturday night, including a magnificent play that led to an interception for the fighting Irish, Derrick was fielding a complaint from a parent on the bus, who was upset by another adult’s cussing on the trip. Cussing is forbidden at our center, a bright-line rule to help us live our values, and this was a flagrant violation by an adult who knew better. Instead of rushing home to see his own son play, Derrick called the adults on the bus into an impromptu meeting, a meeting that lasted an hour as they delved into why it happened and why it wasn’t corrected by others when it did. In the business world, we often say culture eats strategy for breakfast. The same is true in life. The culture surrounding our kids can eat the very best strategies we have for helping them. That is why we work so hard at building a culture based on our values of love, excellence, hard work and relationships, not just at our center, but in a way that extends into the homes and community that surrounds us. We need more people to join us as coaches or reading mentors to help make our kids and the culture that surrounds them healthier and stronger. It will take some sacrifice. You may find yourself late for your own kids’ games, but you, they, and our world will be better as a result.